When entering the Kingdom of Thailand, please be mindful of the last day on your stay permit and DO NOT stay longer than the permitted date. If you have already overstayed beyond the permitted date, you must leave the country before the order’s enforced date (20 March 2016). An alien who overstays more than 90 days beyond his/her permitted date will be banned from re-entering the country for 1 year, starting from the departure date. 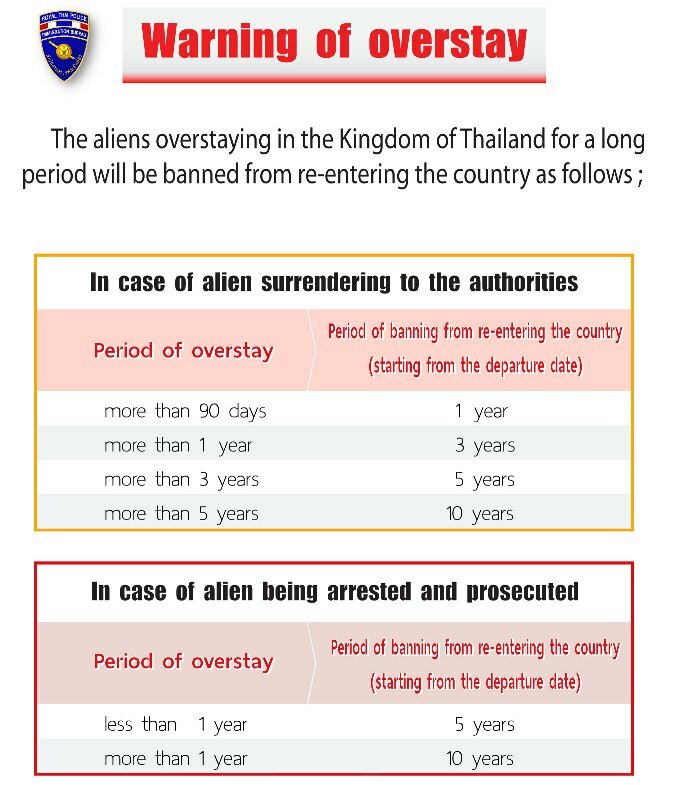 An alien who overstays more than 1 year beyond his/her permitted date will be banned from re-entering the country for 3 years, starting from the departure date. An alien who overstays more than 3 years beyond his/her permitted date will be banned from re-entering the country for 5 years, starting from the departure date. An alien who overstays more than 5 years beyond his/her permitted date will be banned from re-entering the country for 10 years, starting from the departure date. An alien who is caught overstaying less than 1 year beyond his/her permitted date will be banned from re-entering the country for 5 years, starting from the departure date. An alien who is caught overstaying more than 1 year beyond his/her permitted date will be banned from re-entering the country for 10 years, starting from the departure date. If you have already overstayed beyond your permitted date before the order’s enforced date (20 March 2016), you may surrender to the authorities at the Immigration Checkpoint (land border, seaport, and airport). You must pay a fine of 500/day, but not exceeding 20,000 baht before you are allowed to leave the Kingdom of Thailand.